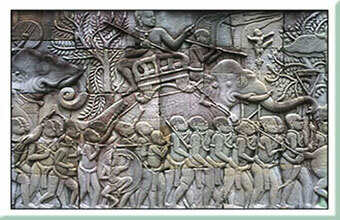 Siem Reap is a gateway for many tourist trips to some of the most fabulous monuments ever build by mankind. The temple of Angkor Wat is one of the Seven Wonders of the World and symbol of the Cambodian Kingdom. 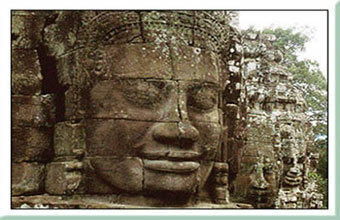 Angkor Wat is dedicated to the God Vichnu with whom king Suryavarman was integrated on his death. This face gives the approximate date of the monument. Although, unfinished it was probably built between the years 1112 and 1182 AD. It took more than 25,000 labours over 37 years to build. The outside walls of the temple is surrounded by ditches 190 meters wide. These form a vast rectangle of 1,300 square meters. The sandstone borders, steps and curbs are more than 10 kilometres in length and 3 meters high. Packages are for 3 or 4 days staying in four star accommodation, Angkor Riviera Hotel. The return journey can be booked to either Koh Chang Bangkok or Pattaya. Each Room at the Angkor Riviera Hotel is fully equipped with an elegant standard of luxury, comfort with modern amenities and commands superb view of the river, the hotel swimming pool and the traditional outdoor market. 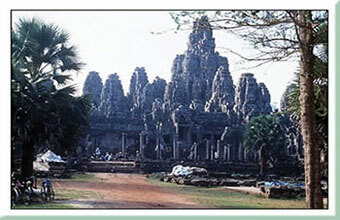 Additional information on Angkor Wat the town of Siem Reap and other temples in the the archeological park. If you are travelling back into Thailand you will only be eligible for a 15 day visa exemption if travelling by land or 30 day visa exemption if travelling by air. You should try to plan your trip to Cambodia at the end of your holiday in Thailand unless you have a multiple entry visa for Thailand. Prices are per person but do not include Cambodian Visa. We do however offer an express visa service at the border. If you would like to book a package or require additional information send us an e-mail with your questions or your booking to..
VIP Minibus from Koh Chang to the boarder followed by a 3 hour taxi ride to Siem Reap (9 hour trip). This package includes a 2 night stay in a 3* Hotel in Siem Reap for 2 people sharing. 2,900 baht.